The Associated Press reports PBS has cancelled the Charlie Rose TV show. Similarly, CBS News has terminated Rose’s employment as a correspondent and CBS This Morning co-host. Rose’s CBS This Morning co-hosts — Gayle King and Norah O’Donnell — kicked off today’s edition of the CBS morning show addressing the situation, prior to the termination announcement. Watch their discussion, below. Both the PBS cancellation and CBS firing come on the heels of a story The Washington Post published on Monday, in which eight women alleged the veteran journalist sexually harassed them. Three of those eight — Reah Bravo, Kyle Godfrey-Ryan, and Megan Creydt — levied their allegations on the record. Additionally, Rose’s executive producer, Yvette Vega said, “I should have stood up for them,” when the paper contacted her about the accusations. 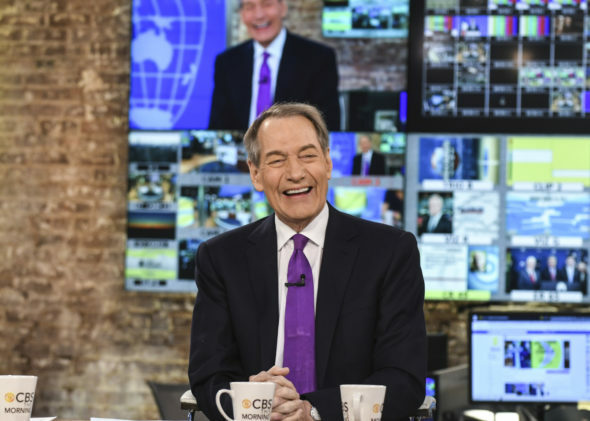 A long-form interview talk show, Charlie Rose premiered in 1991 and has been syndicated by PBS since 1993. Rose has been a CBS This Morning co-host since January of 2012. He has also worked as a correspondent on the network’s premier news magazine show, 60 Minutes, as well as its cancelled spin-off, 60 Minutes II. What do you think? Did you watch the Charlie Rose TV show? Will you still tune into CBS This Morning? Were you surprised by this turn of events? Sound off, in the comments. More about: 60 Minutes, 60 Minutes II, 60 Minutes II: canceled or renewed?, 60 Minutes: canceled or renewed?, CBS This Morning, CBS This Morning: canceled or renewed?, CBS TV shows: canceled or renewed?, Charlie Rose, Charlie Rose: canceled or renewed?, PBS TV shows: canceled or renewed?, Syndicated TV shows: canceled or renewed? 60 Minutes: What Will Happen to Charlie Rose’s Upcoming Stories? I think that CBS & PBS should have listened to the accusations and proven whether if he was innocent or guilty of the charges before dismissing him. I am not sticking up for Charlie Rose, but there are so many women accusing men of sexual harassment. But this cannot keep happening to women. David Rhodes and others in the same kind of positions need to wake up to the concept of innocent until proven guilty because if not then they open themselves open to anybody looking to make a quick buck by making a false allegation, which, in the current climate of fire before knowing the truth might just come back to haunt them.